The Art of Feng Shui in Garden Design | Global Garden Friends, Inc.
No home is complete without a garden. It provides an atmosphere that’s perfect for relaxing and communing with nature. You can amplify these qualities by using the energy-channeling principles of Feng Shui. Despite the complex nature of channeling energy, Feng Shui in essence is very straight-forward and intuitive. 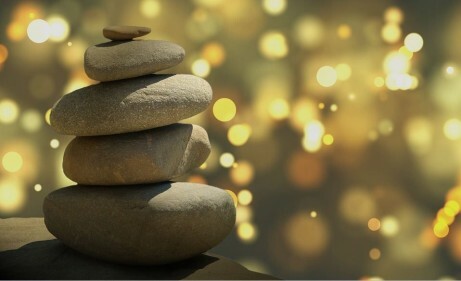 Simply put, Feng Shui is a Chinese principle centered around creating harmony in one’s environment. Here are just four steps to take in incorporating this ancient and refined method of balancing harmony into your garden design. Bagua is a concept that serves as the starting point for Feng Shui design. It is an “energy map” made up of nine sections. Each of these sections relates to nine important areas of your life. Apply the bagua map over your garden’s layout and be aware of how it fits into the overall bagua map of your entire home. This teaches you where the energy fields in any space are as a whole or as part of a larger whole. Knowing this will help guide you in regards to what should be placed where in order to create beneficial energy flows both in your garden design and how it affects your life. For example, the northwest is the center of wealth and prosperity, the northeast the center of love and relationships, and so forth. Feng shui is rooted in the five elements. In this tradition, the elements are water, wood, fire, earth, and metal. Each element resonates with different energies and should be used in the appropriate space of your bagua map. For example, the element of water, when in motion, assists in the flow of wealth and prosperity in your life. This can be incorporated into the corresponding areas of your garden with water features, such as fountains and creeks. Still water calms the energies in the area it is placed in, and can be created with koi ponds or water-themed colors and statues. Consider the scope of your project, budget, and desired energy flow when choosing how to incorporate the elements into your garden. While it can be tempting to keep to the flashy and exciting elements like fire and water, the role of the garden is best utilized in the element of earth. The earth element is, not surprisingly, valued for its grounding qualities. Bring out the earthy aspects of your garden with paving and stonework, as well as metal in the form of fencing or statues. Another way is to create mulch paths, and of course, bringing in a variety of local plantlife. For the best results, it is important to consult with residential landscaping services to ensure that the placement of pathways and plantlife is done professionally and organized in a way that is best for the health of your plants. In Feng Shui, wood symbolizes both creativity and gathering of energy. You can incorporate this into your garden with a patio. Large or small, a patio extends the liveliness and comfort of your home. Make it cozy and inviting with fairy lights or lamps. You can add the feng shui “fire” element into the mix with a fire pit. This element is valued for its properties of energy and activity. What better way to amplify the joy of bringing your loved ones together? Keep in mind your bagua map when incorporating these gathering energies, and utilize the right areas of your garden to attract what you need most in your life. For example, “helpful people and travel” are attracted through harmonizing energies in the southeast, whereas “love and relationships” rely on energies in the northeast. In a tumultuous life, a garden can be a great place to seek refuge and respite. However, it can also be organized in a way that brings harmony to your life as a whole by balancing the energies that flow through it. Whether you focus your Feng Shui in your home and garden for the sake of bringing prosperity and wealth, becoming closer to friends and family, or even just to bring peace and centering to your life and energies, these tips given here are a great way to get you started.